We started out day 3 at a cafe near our hotel. 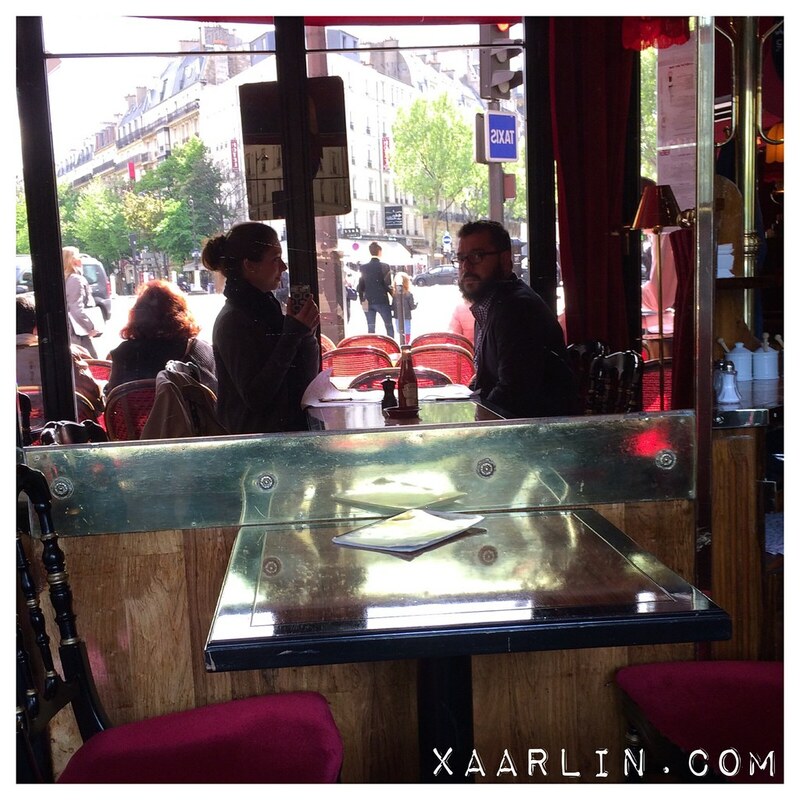 I loved the decor of this place- made me think of what Paris might have looked like in the 1920's. 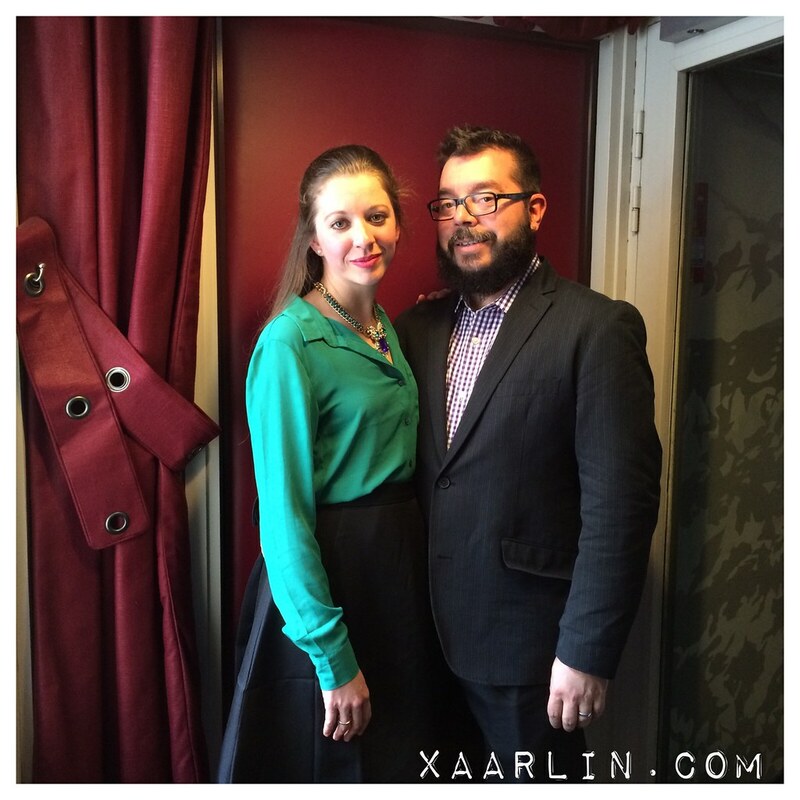 Before leaving the hotel for petit dejuner, we asked the concierge if they could call and try to make a reservation for us at one of the 2 fancier restaurants we had discovered online. Both were sold out online, and since our French was terrible, it was awesome he wanted to help us out. We wouldn't know until later in the afternoon if we actually got reservations. 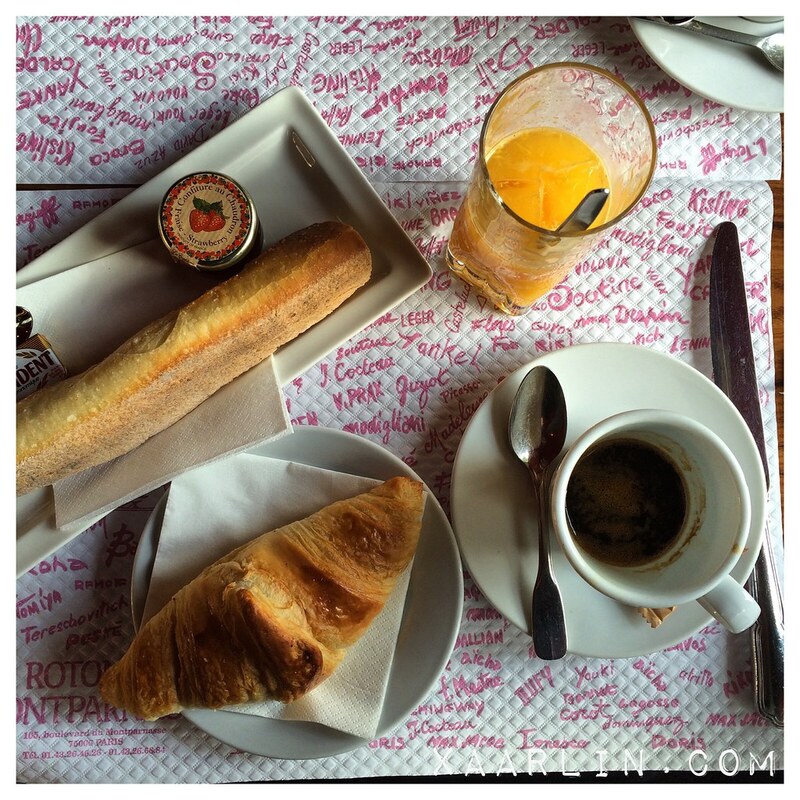 I had a traditional french breakfast- basically carbs on carbs. Fresh squeezed OJ, an espresso, a french bread, a croissant and delicious strawberry jam. I could eat this every single day. 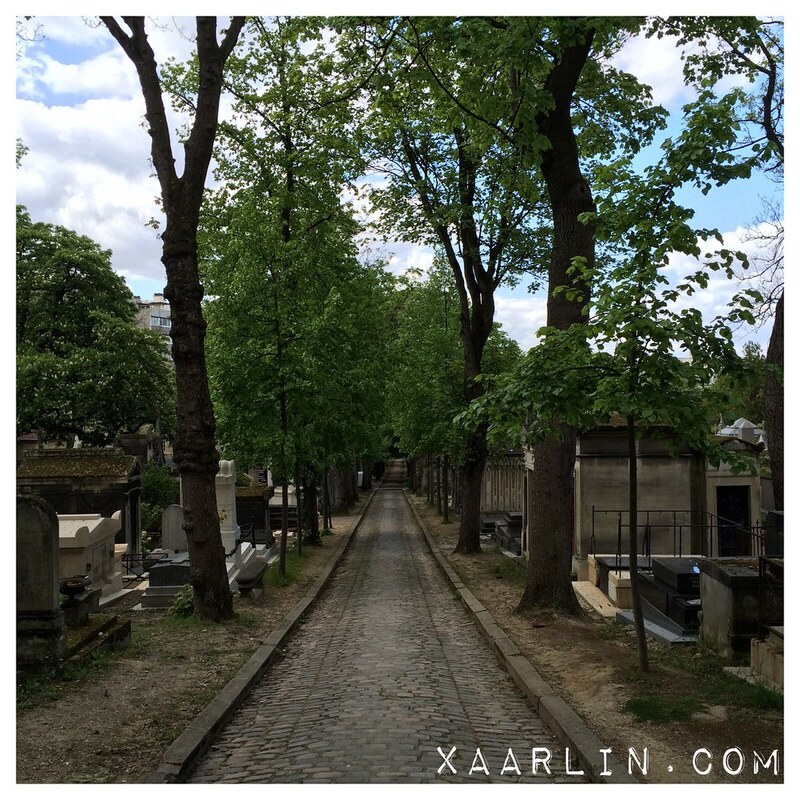 After breakfast we took the subway to Pere Lachaise Cemetery. 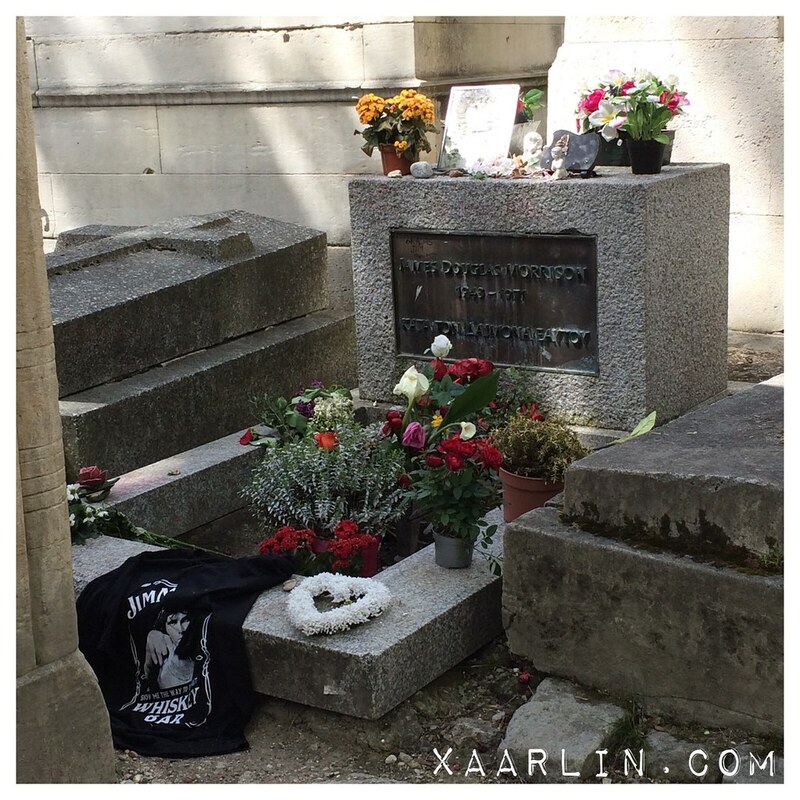 Our first stop was Jim Morrison's grave. Also: Thank you google maps for pointing us in the right direction once in this massive cemetery. 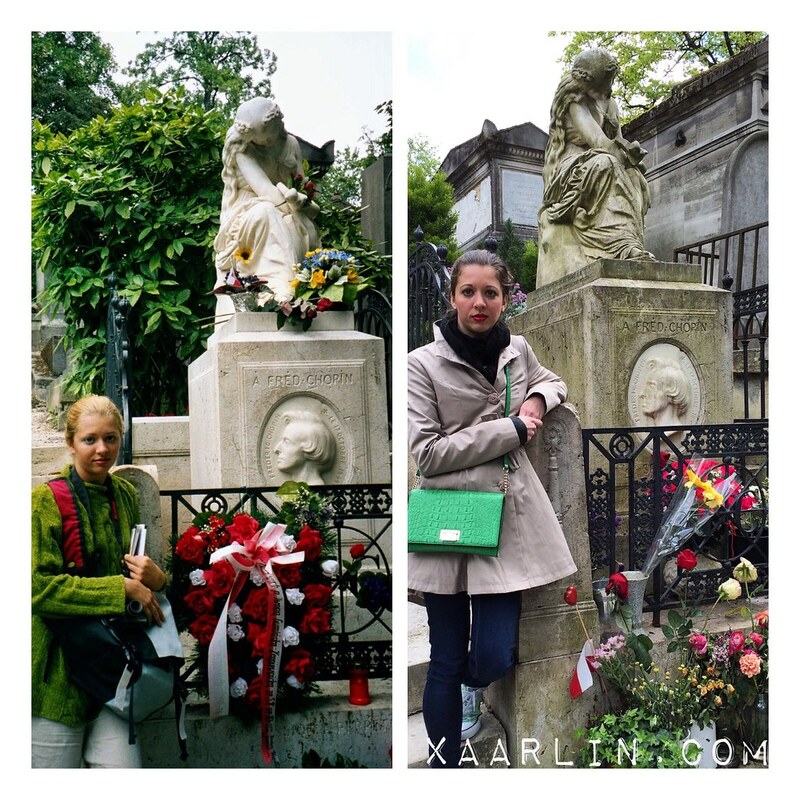 Then we found the famous composer, Chopin's tomb. We even made a new creepy friend! The cemetery is huge- we didnt see many other folks there the day we went, which was a nice contrast to the craziness of the more popular destinations we went to. 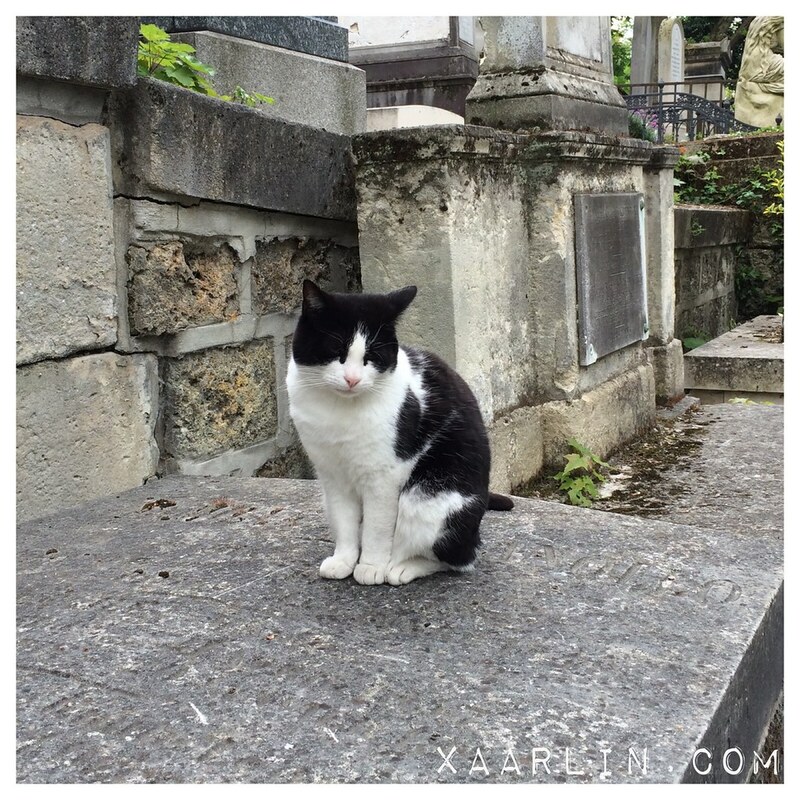 After the cemetery, we decided to walk to a beer bar I had found. 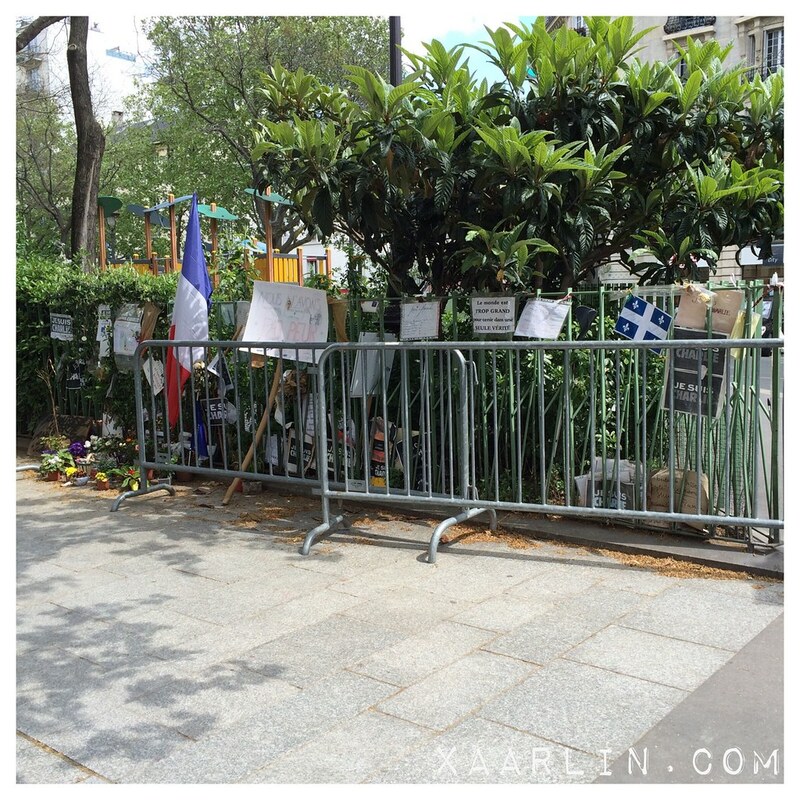 Along the way we saw a Charlie Hebdo memorial. The beer place ended up being closed so we decided to grab lunch at a place we had seen on Anthony Bourdain- but on the way we saw this huge monument. We went to "Du Pain et des Idees" for the best bread in the world. 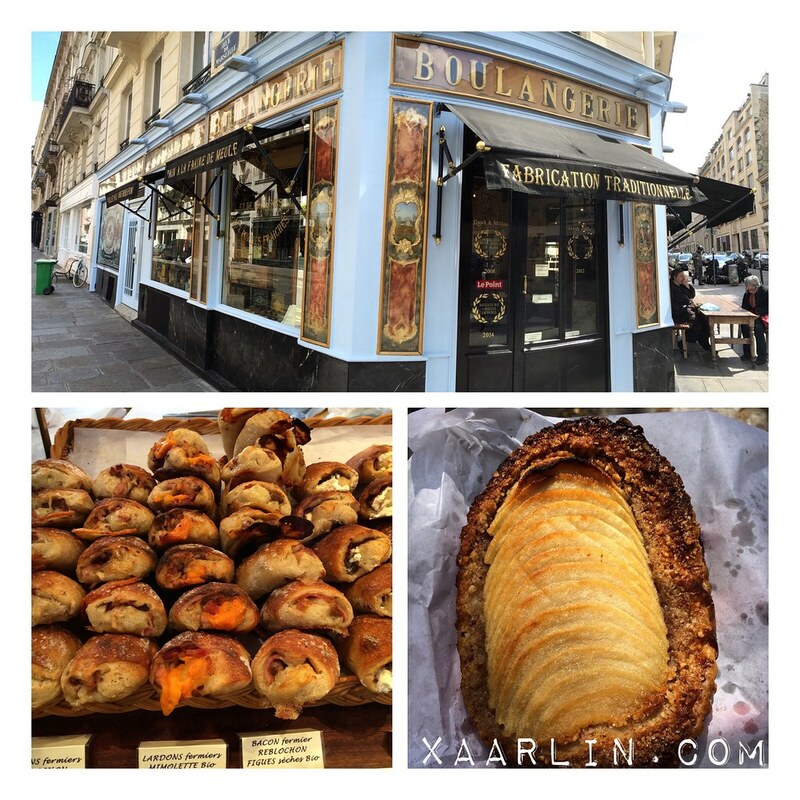 Most places in Paris do not specialize in either bread or pastry. This place is solely bread and it is out of this world delicious. I got a bread filled with tomato and goat cheese, and an apple tart which was better than any apple bread I had eaten before. We eventually made our way back to the hotel and found out we were able to get a reservation at our #1 choice restaurant for dinner. I forget where I had found restaurant "Spring," but it sounded amazing- they don't have a set menu but create the menu based on whatever looks the best at the market that day. Later on I found out the chef is from Chicago. We had the tasting menu which was quite an experience. There was no "menu" but instead the waiters wanted each course to be a surprise to us. We had no idea what we would be eating until the plate arrived at our table. We also got the wine paring which complimented each dish perfectly. I still need to track down some of the wines we had that night because they were so different than some of the wine I've had previously. 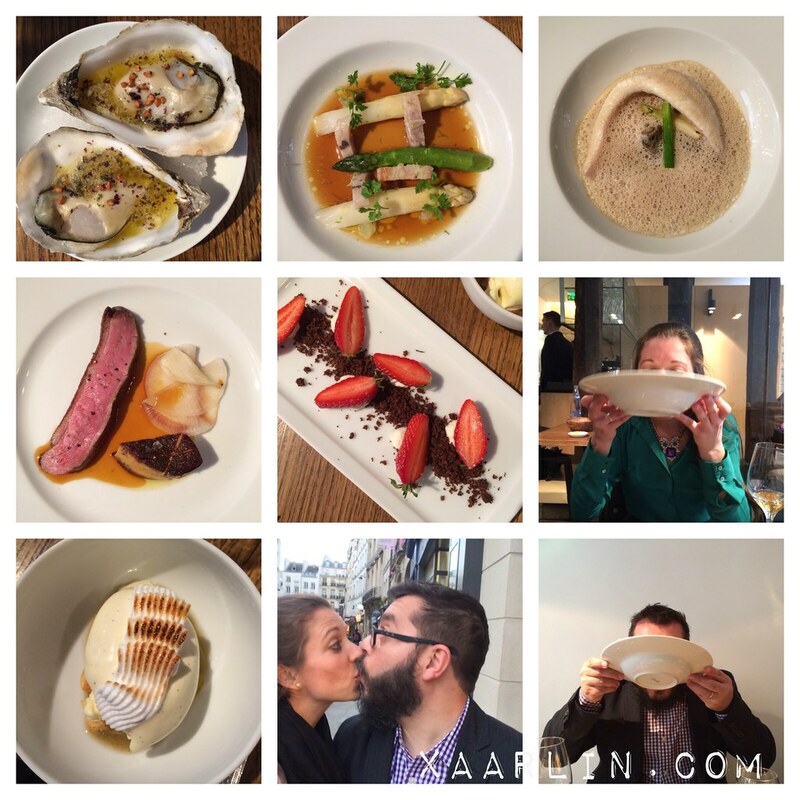 We had cooked oysters with butter, roasted asparagus with fish in a smoked tea broth, a filet of sole in a morel mushroom broth (we were encouraged to drink it straight from the bowl! ), seared duck breast with turnip and foie gras, and an amazing trio of desserts. This dinner is one we will not forget. The whole experience was so different than anything we've had before, and the food was out of this world fresh and delicious. 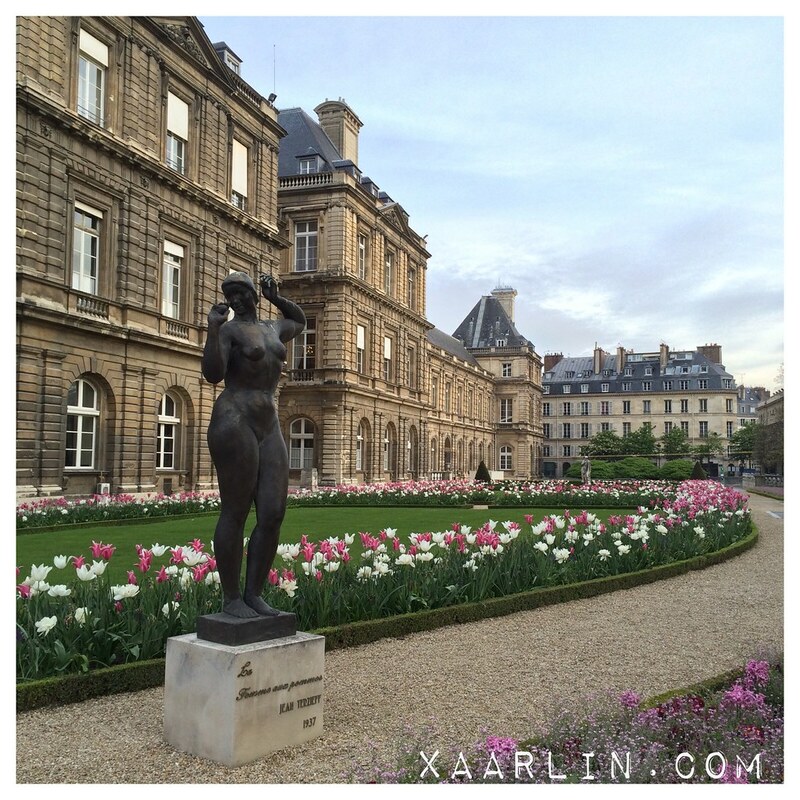 I would love to come back to Spring next time we visit Paris. 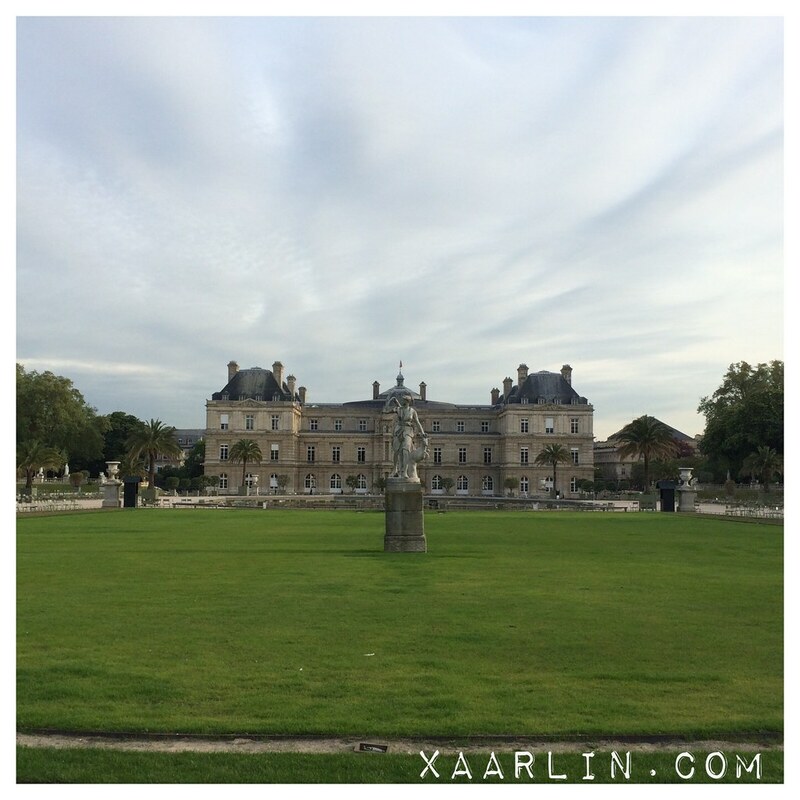 On day 4, and our last day in Paris, we finally went for a run around the Luxembourg Gardens. 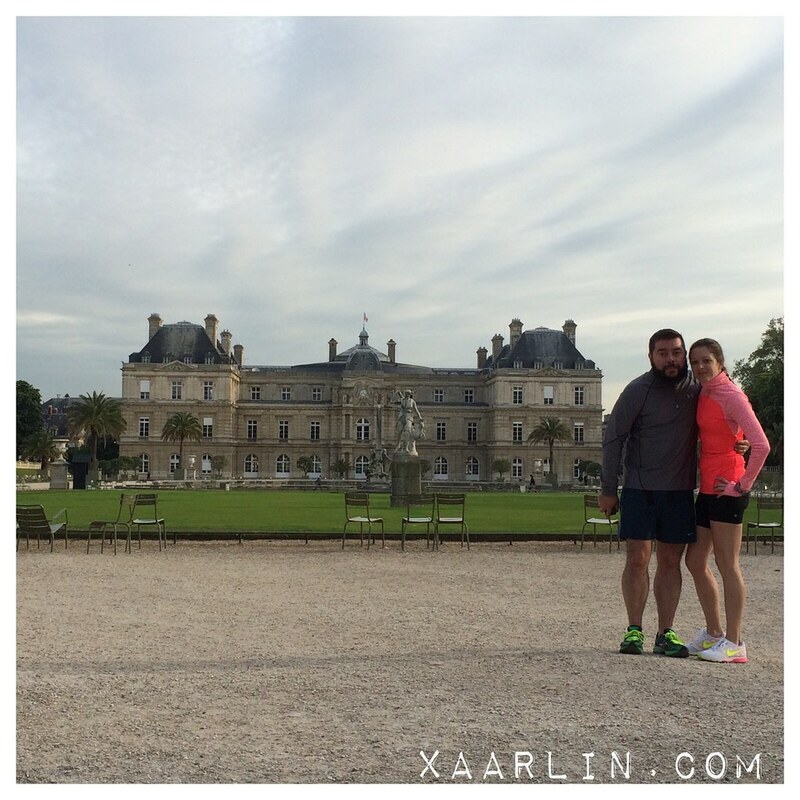 The gardens were only a 5 minute walk from our hotel and was the perfect place to enjoy a run before departing. We did a few laps around the gardens and took photos. This park is so beautiful and never seemed super busy with people in the times we walked through it. There were playgrounds, and bocce courts complete with coat racks. 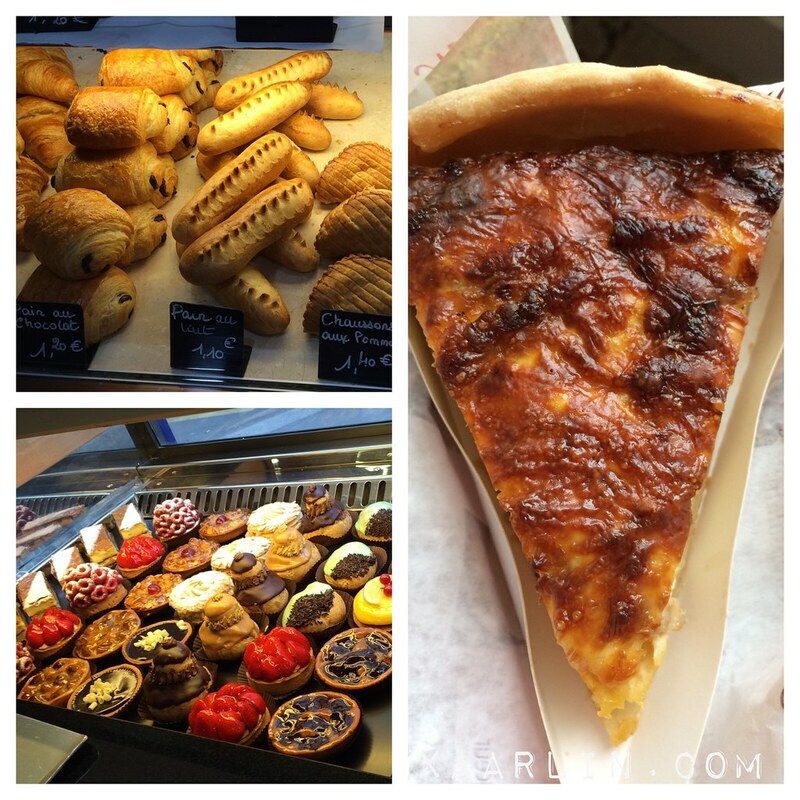 After our run we stopped at a cafe near our hotel and I got a quiche Lorraine. 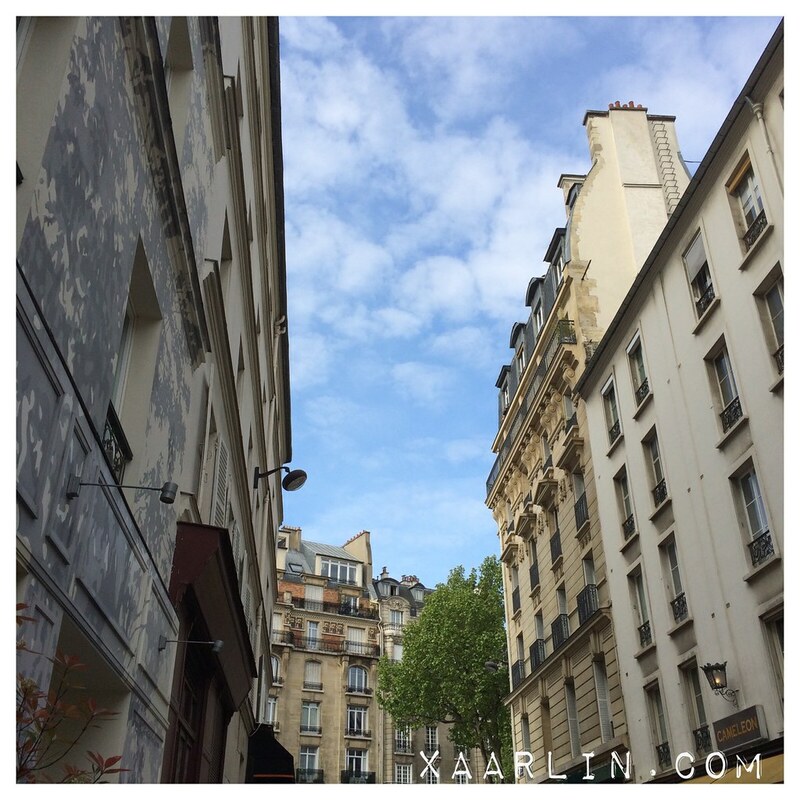 It was the perfect end to our stay in Paris. I loved the street our hotel was on (Hotel Apostrophe). 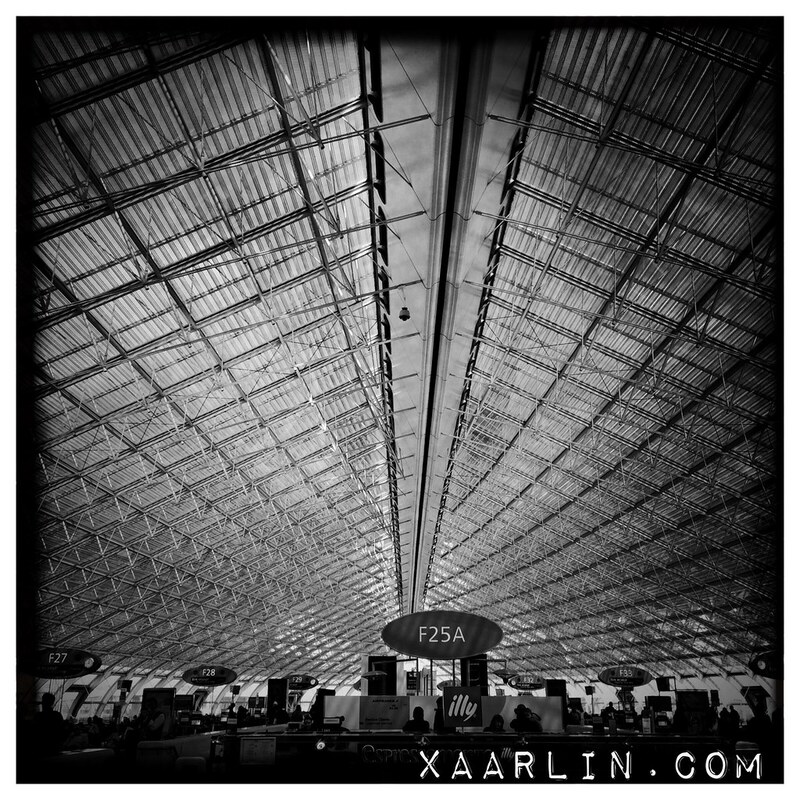 A 30 minute cab ride later and we were at CDG for our flight to Copenhagen. We had to check our carry on suitcases because the small suitcase + our carry on bag were more than the allotted 12kg per person. Yes- they weigh both of your bags together. 60 Euros later we were on our way! We had such an amazing time in Paris. 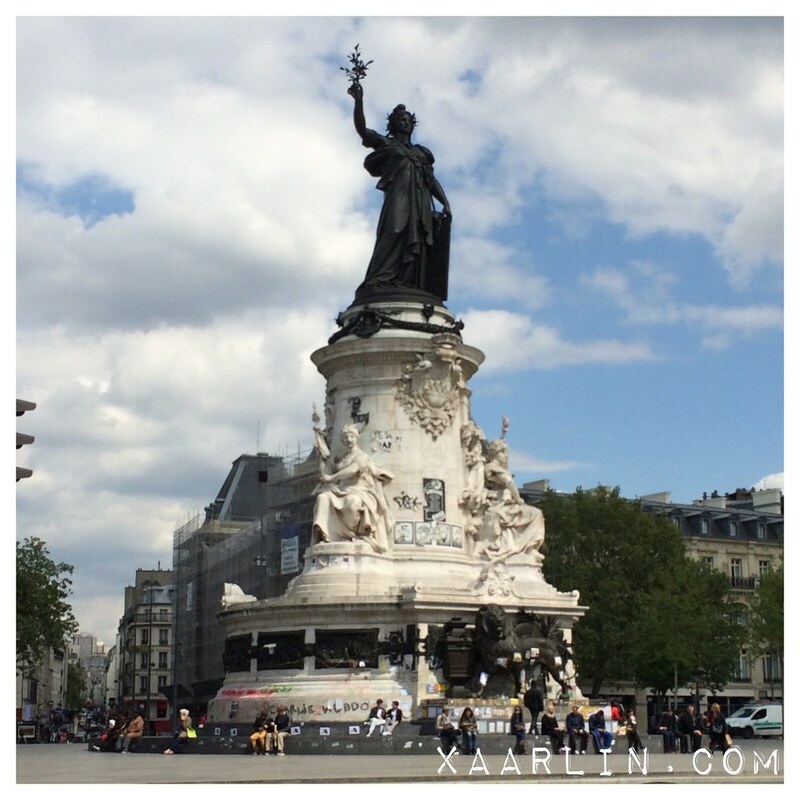 The food, the people, the architecture were everything we had dreamt about and more. I really hope we can return sooner than the 13 years it took me to come back. 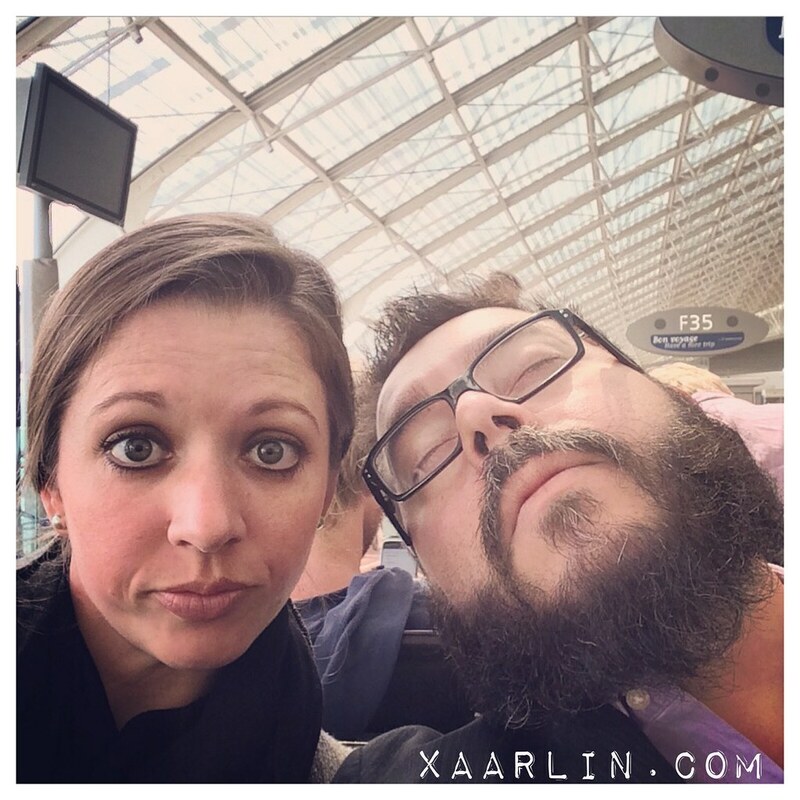 And then we were off to Copenhagen! I love the pictures of you guys slurping out of your bowls! Ha! I love dinner experiences like this, where they do all the decision making for you and you can just sit back and enjoy. YUM!